Rebecca Ragain wrote a comprehensive preview article of Ten Tiny Taiko Dances in Just Out. Ragain explains both Ten Tiny Dances and taiko. She also provides a context for the collaboration with quotes from curator/creators Mike Barber and Michelle Fujii. Keywords from the article that resonate with me include exclusivity, constraint and liberate. Photographs in this post are by Joni Shimabukuro. The one on the left features Keiko Araki and Kelsey Furuta performing my work Fifteen for violin and taiko. 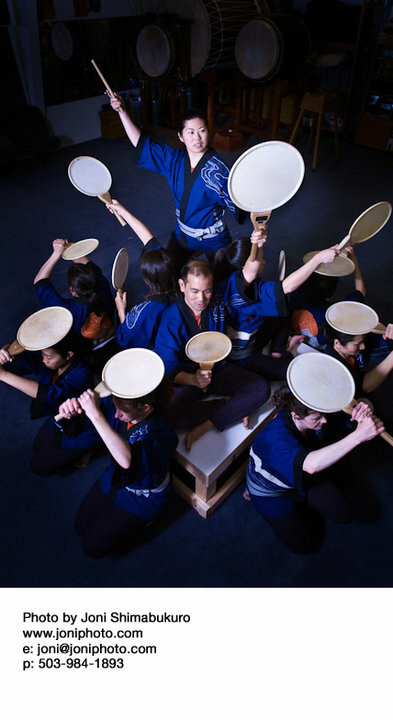 The photo below features Fujii with Portland Taiko playing uchiwa (fan drums). Portland Taiko presents Ten Tiny Taiko Dances from June 19-20, at the Portland Center for the Performing Arts.